You have come to the right place if you are looking for fun, learning and engaging Angel themed activities to do with toddlers, preschoolers and kindergartners. Our activities are used by teachers, moms, dads, child care providers and more! Copy a picture from a coloring book of an angel, and make a copy for each child. The children bring in a picture of him/herself in. Cut the angel figure out & then the angel’s face. Help the child tape or paste their picture to the angel’s body. Then, the child colors the rest of the angel’s body with crayons or markers. Reinforce the angel figures by gluing cardboard on to the back of the angels. You can make a bulletin board with the theme “Our Little Angels” or you can punch a hole in the top of the figure; add some thread and use for an ornament. Make a bookmarker out of construction paper, posterboard or felt. Put on it “Thank you for being so special” or “Thank you for being kind as an angel”. The children then draw angels on the bookmark and glue stars,sequins, Etc. This is a lesson that people at times can be kind as angels. Then the children give their bookmarker to someone special who helped them through a scary or tough time. You can use any size doilies, but the smaller ones turn out better. If you use small doilies, each child needs 1/2 a pipe cleaner. If you use large doilies, each child will need a whole pipe cleaner. First, the children need to cut the doilies in half. Make a cone shape with one half of the doilies and glue or staple closed. Glue a white pom-pom (cotton balls work, too!) to the pointed part of the cone. You now have the angel’s body and head. Glue or tape the pipe cleaner in the middle of the other half of the doilie so that about two inches is sticking up above the cut part of the doilie. Glue or staple this half of the doilie with pipe cleaner attached to the back of the the angel’s body. The curved part of the doilie should be on the bottom. These are the angel’s wings. Curve the part of the pipe cleaner that is sticking up into a circle to make the halo. For an added touch, sprinkle gold or silver glitter on the doilies before assembling. If using during Christmas, attach a gold ribbon for hanging as an ornament. Using poster board trace each one of your children’s feet once, using white for her dress and both hands using yellow for her wings. Cut their face from picture and glue to body add string to make it hang and add a piece of the sparkle pipe cleaner for a halo. Using a paint pen, date the bottom of the angel. Because she is a part of me!! Her wings are my hands, Her body my feet! And on our tree she’ll look very sweet!!!! Place the 2 pieces of 4″ wide lace on top of each other. Gather top, pull thread tight leaving a small hole. Knot. This is the dress. Slip dress onto round part of clothespin, glue. Glue ball on top. For the wings, join each piece of 1 1/2″ lace with glue to make a tube. Overlap the 2 pieces in the center, gather up the middle, wrap thread around and tie tightly. Glue wings onto dress just below the head. Make a halo by forming a small circle from a piece of shiny pipe cleaner. Tie a piece of thread or ribbon through this for a hanger and then glue halo on to head. Glue the wood ball on top of rigatoni. Glue the tiny pasta on the wood ball. Glue two elbow pastas for arms coming toward each other in front of angel. Add bow pasta in back for wings. Paint white. Can add facial features if desired. Can add a gold halo of various materials. Cut an isosceles triangle, two rectangles, and a circle from construction paper for each child. Or have the children trace around patters and cut their own shape. Show children how to arrange the shapes to make an angel. Have the children glue the angels to a 1/2 sheet of construction paper. Make snow angels in the snow, or sand angels in the sand at the beach. Lie down on your back and move your outstretched arms up and down to leave an angel print in either the snow or sand. In Jacob’s dream there is a ladder with angels going up and down from heaven to earth. God said, “I will take care of you” Make ladder out of toothpicks or popsicle sticks. Cut out and laminate various colors of paper angels, add white cotton balls to the water table. The children can sort and play with the angels. Talk about different ways that people can be angels. Ask each child to name one person in their life that they would consider an angel, and why. 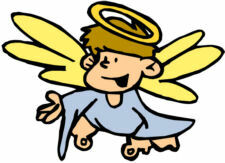 Perhaps make up a class angel book, with each child’s angel featured on a page. Display on Open House night for parents and family to view. Have angel-shaped cookies for snack.